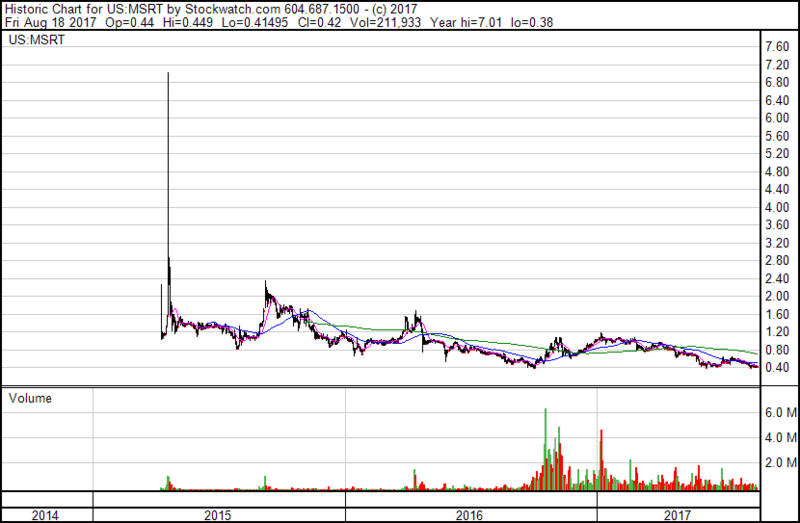 After the close on Friday, MassRoots (OTC: MSRT) filed an 8-K with the SEC disclosing a financing. The company completed a private placement on August 17th, raising $950K from the sale of $1.045mm convertible notes and $0.50 warrants (a 9% discount to the principal) in a deal that comes with materially worse terms than a recently completed transaction. The notes are convertible at the lower of $0.75 or a “25% discount to the to the price at which the Company next conducts an offering after the issuance date of the Note.” If the company doesn’t pay the notes off by the six-month maturity at $1.15mm within 90 days or $1.306mm thereafter, then the conversion price would be “equal to 65% of the average of the three trading days with the lowest daily weighted average prices of the Company’s common stock occurring during the fifteen days prior to the Notes’ Maturity Date.” The company could be forced to issue up to 500K shares as well if the notes aren’t paid off or converted by the maturity date in February. This financing is substantially worse than the most recent deal announced in late July, with the company raising $1.217mm by selling shares at $0.50 with $0.65 warrants. In late 2016, the company sold 10mm shares at $0.50 with $0.90 warrants, raising $5mm in gross proceeds. This financing occurred after MassRoots defaulted on $1,46mm convertible debt issued in March 2016, ultimately making payments of $1.479mm in cash and issuing 2.378mm shares. The most recent 10-Q for the quarter ending 6/30/17 indicated that the company, which produced sales of only $277,614 in the first half of 2017, had just $31,247 cash on the balance sheet, having used $5.2mm to fund operations in the first half of the year.